If your garden looks untidy or if your yard needs repairs, trust Ricky Tyler Landscapes to get the job done. We offer residential grounds maintenance in Enfield, London and across the surrounding areas. Need a trusted landscaping contractor for ongoing grounds maintenance at your business premises or public site? Our skilled professionals will get the job done on time and on budget, with fantastic results every time. From lawn care and turfing to garden maintenance and grounds management, no task is too big or too small for our experienced and talented landscapers. We can work with you from design to completion, transforming outdoor spaces for our clients. Simple repair tasks are also no trouble, with friendly gardeners here to help you with mowing, pruning, planting and fence repairs. 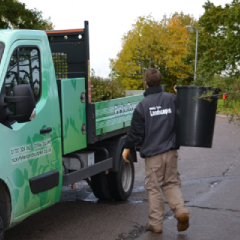 Ricky Tyler Landscapes offers commercial grounds maintenance to local authorities, care providers, schools, hospitals and businesses across the Enfield area and throughout North London. We also support local homeowners in creating and maintaining their perfect gardens. A highly respected crew of landscaping professionals, you can count on us to meet - and exceed - your expectations. You're in safe hands with our residential and commercial landscaping specialists; all work is fully guaranteed and completed by qualified, insured specialists. We are approved for working at height, so we can take care of dangerous problem trees and can undertake tricky roof landscaping tasks for more elaborate designs. You can be sure that everything will run to schedule and that you'll be kept informed at every stage - service is at the heart of what we do. Would you like to know more about how Ricky Tyler Landscapes can help with your commercial or residential landscaping or grounds maintenance project in Enfield, London? Ricky Tyler Landscapes can provide gardening and grounds maintenance services including Enfield Grounds Maintenance covering Enfield, London .